Do something sweet for someone with cancer this May. When someone having cancer treatment attends a Look Good Feel Better workshop they undergo more than just a visible transformation, they undergo a mental transformation too. So often those attending a Look Good Feel Better class tell the volunteers how they felt they were no longer the person they were. The treatment had robbed them of not only their hair but their confidence and self-esteem. “When you go through chemo it's your mind that needs to be uplifted. To be confident to walk out the door now and look amazing even though I’m struggling has really uplifted my spirit mind and body. I'd like to just say thank you for the awesome experience and the kindness of all the volunteers” 2016 participant. While the Look Good part of the programme may be the most obvious on the day itself, The Feel Better part of our programme extends well past the class, into the lives of those affected by cancer. It can change their appearance, confidence, positivity, self-esteem and the way in which they interact with family, friends and the community. That is what Look Good Feel Better is all about. Our local classes are free, and provide an experience for participants to gain control and normality at a time when treatment may have taken over their lives. It is one day that is about the person, not the disease or medical appointments. This is the 11th year that Bakers Delight has supported Look Good Feel Better. We hope you enjoy the Pink Buns, and are able to share with your audience the amazing work in so many communities our over 900 volunteers and tutors can do when they buy these sweet treats or write a butterfly message and pin it at a local Bakers Delight. Every pink bun sold directly helps to fund free Feel Better classes in communities all around New Zealand. 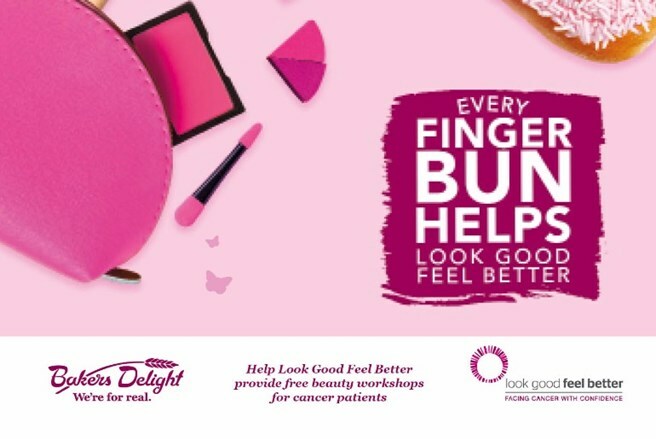 Bakers Delight are selling three pink products this year to support Look Good Feel Better, the regular Pink Finger Bun were $1 from every bun sold is donated, the Pink Butterflies were a gold coin donation from every butterfly is donated and their new Mini Pink Finger Bun 4-packs were $2 from every 4-pack sold is donated to LGFB. Last year more than 3,000 individual packs were prepared for women to participate in Feel Better classes, and registrations for the classes to date indicate the need for workshops in 37centres throughout the country this year. The Baker’s Delight’s Pink Bun Campaign will ensure that the monies raised will keep the classes free. Thank you so much. Enjoy, share and delight in this treat.